Even though I came up short on ingredients for this recipe (I swear, the first time this has EVER happened! ), these cookie bars still turned out to be delicious. Raspberry jam is spread over a cookie-like crust, and then topped with more of the crust for a sort of chewy dessert sandwich. The batter is your typical sugar cookie batter, but with vanilla and almond extracts added for a wonderful background palate pleaser. And I can't forget the addition of the oats, which added a chewy texture. Interestingly enough, I was short on the amount of oats by about half, and I don't think the texture was harmed at all. In fact, I wonder if maybe another cup of oats would have made this bar too granola-y and less cookie. 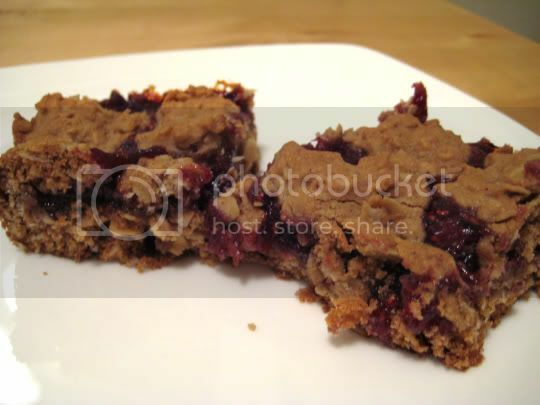 I was also probably a few tablespoons short of raspberry jam, so the bars could have been a little more fruity and chewy. Overall, the texture of the bar was a mix of chewy, crumbly, and crispy. And the flavor was almost fig newton-ish, but with raspberries. Very yummy, and I think the oats provide the illusion of a healthy cookie! Make again? Yes, making sure I have ALL the ingredients next time.